New research published in the journal Nature (Scientific Reports) found that nanoparticles from tattoos can travel to your lymph nodes. Scientists from Germany and the European Synchrotron Radiation Facility in France analyzed the bodies of four donors with tattoos and compared them with two donors without tattoos. They found that tissue samples from two of the inked donors had stained lymph nodes matching the elements on the pigments on their skin. Among the nanoparticles were five elements that they identified as “toxic,” which were aluminum, chromium, iron, nickel and copper. The tissue donors were anonymous, so the researchers did not have any health information about them. The study stopped short of suggesting that the nanoparticles can cause any adverse health effects. But the researchers say their findings should be taken into account for those planning on getting tattoos. Dr. Lisa Kellett, a Toronto-based dermatologist who has been practicing for 25 years, said the findings are not surprising, especially because it is well known that tattoo pigment can migrate (for example, when tattoos get blurrier over time because of ink migration). 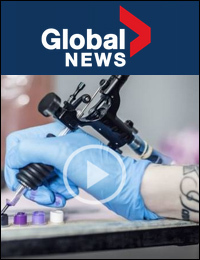 “[This study] basically tells us that the tattoo ink can migrate all the way to the lymph nodes, which is absolutely not a surprise,” she told Global News. Kellett explained that our bodies are programmed to try to get rid of anything foreign, which is one of the lymphatic system’s main functions. Dr. Matthew Cheung, a hematologist who works primarily with lymphoma patients, concurred with Kellett, adding that the study sheds new light on the type, concentration and size of the particles found in the lymph nodes. “The concern would be that we know of heavy metals at certain concentrations or certain oxidized states could be harmful. For example, they could interfere with cellular function or cause cell injury,” he said. Kellett says the greatest risks that come with tattoos are contracting communicable or local infections or developing an allergy to the ink. But she says the presence of pigment in your lymph nodes, in her opinion, is not going cause major damage or injury. “In general, the amount of ink is such a small part of your body that it’s not significant,” she said. However, she cautioned that coloured lymph nodes may pose an issue for doctors treating melanoma patients. Kellett explained that lymph node pigmentation is often used as a marker for malignant melanoma patients, and tattoo ink that mimics this pigmentation may affect a patient’s diagnosis and staging. Cheung says the take-home message from the study is that it highlights how little we know about the long-term safety of tattoos. As the U.K.’s National Health Service points out, there is very little research on the effects of tattoos on human health, due to ethical issues. According to Health Canada, cosmetic pigments such as tattoo ink are not specifically approved by the government body. Instead, they maintain a “hotlist” of ingredients that are restricted or prohibited in cosmetics. “It is the responsibility of the manufacturer or importer to meet the requirements of the Food and Drugs Act and Cosmetic Regulations, and ensure that the product they are selling is safe. The same requirements apply to tattoo inks containing nanoparticles. The Cosmetic Ingredient Hotlist can be referred to in order to identify ingredients (including those that impart colour) that are restricted or prohibited for use in cosmetic products,” a spokesperson told Global News.